Video: Has Shaikh Mohammad called you on National Day? Dubai: A young Emirati girl got more than just a recorded message from the Dubai Ruler for UAE National Day. A video that went viral across the UAE during the last few days showed how a young girl broke down in tears because she did not receive a phone call from His Highness Shaikh Mohammad Bin Rashid Al Maktoum, Vice-President and Prime Minister of the UAE and Ruler of Dubai. After learning of the incident, Shaikh Mohammad did more than just send a message. 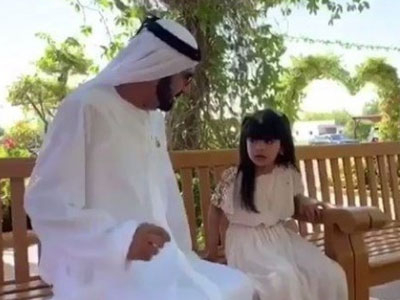 In a video that received over 6,000 views in one hour, viewers can see Shaikh Mohammad as he paid a visit to Salamah Al Qahtani – the girl identified in the initial video – and softly spoke to her while sitting on a bench in the garden. "You are my daughter, may God bless you. Now you can tell everyone that you met me," said Shaikh Mohammad as he kissed Salamah on her cheek. Earlier this week, Gulf News reported how residents across the country received a telephone call from the number 1971. Upon answering the phone, a pre-recorded message of Shaikh Mohammad was then played as he wished everyone a happy 47th National Day.